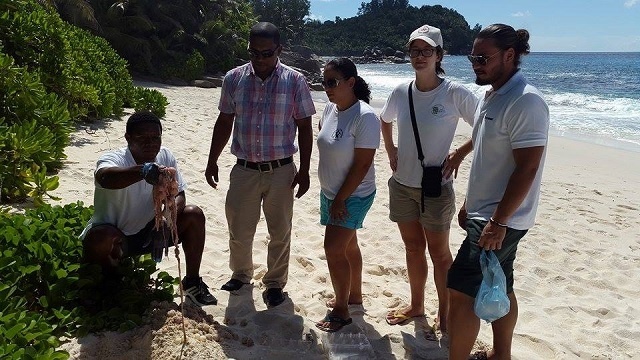 (Seychelles News Agency) - Authorities in Seychelles are stepping up monitoring and surveillance efforts after poaching cases of green turtles have been detected, said a top environment official. The cases of poaching were recorded at Grand Police beach in the southern part of the main island Mahe. The environment conservation officer, Ashley Pothin, told SNA that this is a high point of concern as in the past this area has been strongly targeted by poachers. “Due to the fact that the area is isolated, it has been one of the nesting grounds where we have had a lot of challenges as it is an easy target for poachers,” said Pothin. Seychelles, an archipelago in the western Indian Ocean, is home to one of the world's largest populations of the green and hawksbill turtle. The green turtle breeds throughout the islands all year round, unlike the hawksbill turtles which breed mostly between mid-October and mid- January. Both species are on the International Union for Conservation of Nature’s (IUCN) red list. Green turtles are classified as endangered while the hawksbills are critically endangered. When the hawksbill season starts every year, monitoring efforts and surveillance are intensified. During monitoring, conservationists patrol the beaches where they know turtles might come to nest. Pothin said that poachers have not been deterred as they are still carrying out their despicable acts mostly when the turtles are coming to lay their eggs. Sea turtles in the Seychelles are protected under the Wild Animals and Birds Protection Act and the penalty is up to two years in prison and a fine of up to $37,000. Despite the strict laws, poaching is still a major concern because of the country's traditional appetite for turtle meat. In most cases, because they are the ones that lay eggs, females are more vulnerable. Apart from human-related threats, other reasons nesting success are affected are eggs washed away by waves and steep crests and obstacles inhibiting the female’s progress across the beaches to lay eggs. Once hatched, babies are a favourite food for ghost crabs, birds and fish. Another emerging threat is dogs frequenting beaches and digging up eggs from the nesting holes. Sea turtles lay around 150-200 eggs depending on species and it takes around 2 to 3 hours. The hatchlings will emerge after 8 weeks of incubation.